At the Las Vegas 2018 Winter Market of the Home Furnishings Association, the original memory foam mattress company, TEMPUR-Pedic introduced the total upgrading of its product line. In four major steps, practically all the collections and models listed in 2017 will have been replaced by four series by Spring 2019. With everything else changed, one older model will remain: GrandBed. As of this time, no changes to this classic mattress have been revealed. The basis for classifying TEMPUR-Pedic mattresses has been revised. This is revealed by which models in the former collections the new mattress series are replacing. Now each series will be at the same level as to height and sophistication. For example, instead of having the hybrid mattresses together in the TEMPUR-Flex Collection, they will be in different series. The product revisions coincide with the introduction of TEMPUR-Pedic’s latest materials technology. However, the new TEMPUR-APR is not in the first of these new series, but in the others. The two TEMPUR-Adapt models have the same construction in the upper layers and the cover, but differ in the base layers. They are both 11” high. TEMPUR-Pedic calls this cover the Cool-to-touch Cover. The fibers in this knit fabric are selected for moisture wicking, and the knitting pattern is to enhance breathability, moisture control and conforming stretchiness. It is not as advanced as the dual covers in the following series, since these are the entry level models with lower price points. The comfort layer of the TEMPUR-Adapt mattresses is about 1½” of TEMPUR-ES® Material (TEMPUR-Pedic does not call this memory foam, claiming theirs is closer to the NASA material from which Tempur Foam was developed). TEMPUR-ES is the 4-lb/ft³ foam which TEMPUR-Pedic began using to give their memory foam mattresses quicker response when still cool, with the original 5-lb, foam underneath for deep conformity. This was after Dr. Rick Swartzburg (a chiropractor) pioneered the concept with the Tri-Pedic mattress. Having the 4-lb, Tempur Foam on top also reduces mattress heat, since the lighter foam is less heat sensitive and absorbs less heat than the original material. This, however, works better with airflow to conduct heat out of the mattress, as in Tempflow mattresses, which use the patented Airflow Transfer System. The support layer in TEMPUR-Adapt mattresses is approximately 1½” of the original 5-lb. Tempur Material. It provides more support to the softer comfort foam above. However, since the denser visco-elastic material is more heat sensitive, as it absorbs body heat transferred through the 4-lb. foam, it softens where warmer, letting the sleeper sink in. Therefore, to keep the sleeper from bottoming out, more support is needed underneath. It is the base layers which separate the TEMPUR-Adapt Medium from the TEMPUR-Adapt Medium Hybrid. The TEMPUR-Adapt Medium replaces the TEMPUR-Cloud Prima. The base in this model is 8” of high-density polyurethane foam, divided into two layers. In the diagram, the lower layer appears to be somewhat thicker. The company does not indicate whether these are the same density, but 1.8-lb/ft³ is the standard density for base foam, though some manufacturers have a denser foam in one or more models. The TEMPUR-Adapt Medium Hybrid replaces the TEMPUR-Flex Prima. The base support core is an array of over 1,000 wrapped pocket coils – the actual coil count depends on the mattress size. A ring of HD foam encircles the coil array, holding them in place. Underneath is a 2” HD foam base pad to provide solid support to the coils, therefore the entire mattress. 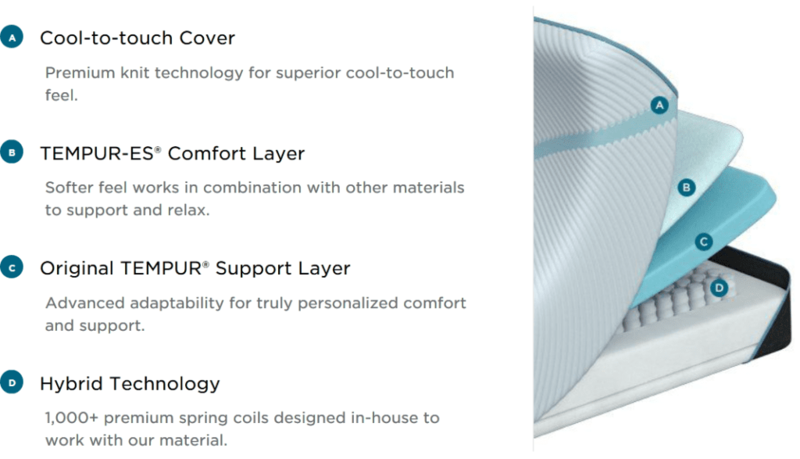 TEMPUR-Adapt Series mattresses are sold in participating stores and online at the manufacturer’s website, Amazon, Wayfair, US-Mattress, and a few other sites. The warranty for TEMPUR-Adapt mattresses are for 10 years and the sleep trial is for 90 nights. 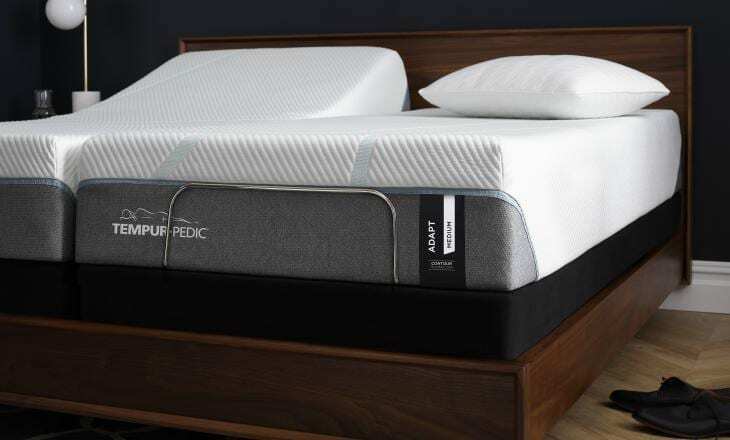 According to industry news articles based on TEMPUR-Pedic’s press release and interviews with Tempur-Sealy corporate officials, the new series are intended to reduce customer confusion when shopping for a TEMPUR-Pedic mattress. With each of the first three series at a certain price level, shoppers can make their selection from among choices within the same price range. Evidently, many customers had to jump from one collection to another to compare mattresses. This seems to meet that goal. On the other hand, the series to be introduced and launched in 2019 will be mattresses with TEMPUR-Pedic’s Breeze technology. These will be grouped not by a price level, but by a key feature. However, this will make it more convenient for shoppers looking or cooler memory foam mattresses. On Amazon and on the TEMPUR-Pedic site, the reviews for TEMPUR-Adapt Medium and TEMPUR-Adapt Medium Hybrid were counted together. Amazon now lists separate reviews for the two models, but the counting started over. The average customer rating on Amazon is 4.25 of 5 stars (85%). Sleep Like the Dead grades the “Adapt Collection” as C+, but this may include all the Adapt series – Adapt, ProAdapt, and LuxeAdapt – which means we cannot at this time single out the TEMPUR-Adapt Series. There are 30 owner reviews of TEMPUR-Adapt mattresses on GoodBed. GoodBed calculates the Owners Rating at 69. The average rating is 2.6 (52%). Since GoodBed is not a retail site, it may serve as a magnet for negative reviews. Since these models are so new, there are not many reviews – 18 on Amazon (both combined and separate), and 30 on GoodBed, and low numbers on several retail sites. These early reviews tell us very little about durability, since none of these have yet been used for an entire year, let alone the three to five needed to see how well they hold up with use. Customer writing reviews have cited a few pros and cons for TEMPUR-Adapt mattresses. After more reviews are posted, the distribution of pros and cons will be clearer. About half the reviewers on GoodBed, which gave the TEMPUR-Adapt mattresses Series an overall rating of 69 (“Poor”), rated Support in these mattresses as Good or Excellent. Not quite as many rated Pressure Relief as Excellent or Good. Less than half the bed owners rated “Sleeps Cool” as better than Fair. All four of the Amazon reviewers of the TEMPUR-Adapt Medium Foam Mattress are Vine Customers Review of Free Products , trusted reviewers who are offered free products pre-release or just after release who are in no way influenced by the vendors. Three awarded 5 stars, and one 4 stars. One compared it favorably to a previous TEMPUR-Pedic mattress, but the box and plastic liner were damaged. Another “Viner” said both she and her husband slept better on it, though they have different sleeping positions. It even tamed his snoring. Another said it was lighter than the old Rhapsody. Most of the cons are for the hybrid model, but the foam model did get one for the weak shipping box. The foam model was too hot for some (especially on GoodBed), and either too firm for some or too soft for others (the so-called “Goldilocks factor”). With so few customer reviews for this series, we cannot post a statistically valid average customer rating at this time.